Copyright © 1997-2019 Enchanted Knights. All rights reserved. As a user, you are authorized only to view, copy, print, and distribute documents on this Web site so long as (1) the document is used for informational purposes only, and (2) any copy of the document (or portion thereof) includes the following copyright notice: Copyright © 1997-2019 Enchanted Knights. All rights reserved. All brand, product, service, and process names appearing on this Web site are trademarks of their respective holders. Reference to or use of a product, service, or process does not imply recommendation, approval, affiliation, or sponsorship of that product, service, or process by Enchanted Knights. Nothing contained herein shall be construed as conferring by implication, estoppel, or otherwise any license or right under any patent, copyright, trademark, or other intellectual property right of Enchanted Knights or any third party, except as expressly granted herein. This site may contain other proprietary notices and copyright information, the terms of which must be observed and followed. Information on this site may contain technical inaccuracies or typographical errors. Information, including product pricing and availability, may be changed or updated without notice. We do our best to prevent such pricing errors, but in the event that this should occur we reserve the right to contact the customer prior to the item shipping and inform them of the price discrepancy. At this time the customer may decide whether they wish to pay the correct price or cancel their order. All images are representative. Due to the nature of our business, items may sell out or be placed on backorder before the website can be updated to reflect these changes. Should this occur, Enchanted Knights will promptly contact the purchaser, who will then have the option to substitute the item, wait for restock, or cancel the item. 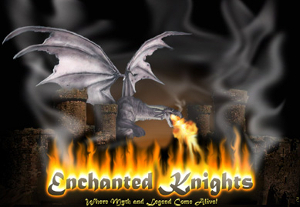 Enchanted Knights and its subsidiaries reserve the right to refuse service, terminate accounts, and/or cancel orders in its discretion, including, without limitation, if Enchanted Knights believes that customer conduct violates applicable law or is harmful to the interests of Enchanted Knights and its subsidiaries. Swords and Knives: All our swords and knives are made of the finest materials and are to be treated as dangerous weapons that can cause serious injury or death. The purchaser assumes all responsibility for usage of the items, and the items compliance with the purchasers local and state laws. The purchaser also, by there purchase, affirms that they have reached 18 years of age and can legally purchase the item under their applicable local and state laws. The shipping and handling rates shown only apply to shipments within the continental United States and military APO addresses. Please contact us prior to ordering for shipping rates for any other destinations. Enchanted Knights retains the right to correct or modify any shipping/handling charges that are incorrectly selected by the purchaser and adjust the amount charged to the purchasers credit card accordingly. In certain instances, due to a shipments excessive weight, size, or unusual shape, Enchanted Knights reserves the right to apply a surcharge to the shipping charges listed on the website. Purchaser will be advised, prior to shipping or charging to the purchasers credit card, of any extra charges that may apply and must agree to the charge prior to completion of the transaction. The risk of loss and title for all merchandise ordered on this Web site pass to you when the merchandise is delivered to the shipping carrier. The information and content on this server is provided "as is" with no warranty of any kind, either express or implied, including but not limited to the implied warranties of merchantability, fitness for a particular purpose, and non-infringement. Any warranty that is provided in connection with any of the products and services described on this Web site is provided by the advertiser or manufacturer only, and not by Enchanted Knights. Any claims of damaged items must be reported in writing within ten (10) days of receipt by the purchaser. Any refunds or exchanges of ordered items, other than report of damages, must be requested in writing within thirty (30) days of receipt of the order by the purchaser. Any refund will not include shipping or handling charges, and purchaser will be responsible for all return shipping costs, as well as any shipping charges for the reshipment of exchanged items. Although the information on this Web site is accessible worldwide, not all products or services discussed in this Web site are available to all persons or in all geographic locations or jurisdictions. Enchanted Knights and the advertisers each reserve the right to limit the provision of their products or services to any person, geographic area, or jurisdiction they so desire and to limit the quantities of any products or services that they provide. Any offer for any product or service made in the materials on this Web site is void where prohibited. GOVERNING LAW: In the event of litigation both parties agree that the Law of the State of business registration of Enchanted Knights shall apply and both parties shall consent to the jurisdiction of said State's courts, or in the event of diversity of citizenship, the United States District Court for the (District). Both parties expressly waive a trial by jury. MISCELLANEOUS: The Terms and Conditions constitute the entire agreement between you and Enchanted Knights with respect to this Web site. The Terms and Conditions supercede all prior or contemporaneous communications and proposals, whether electronic, oral or written between you and Enchanted Knights with respect to this Web site. No modification of the Terms and Conditions shall be effective unless it is authorized by Enchanted Knights. If any provision of the Terms and Conditions is found to be contrary to law, then such provision(s) shall be constructed in a manner to closely reflect, as much as possible, the intentions of the parties, with the other provisions remaining in full force and effect.